After the work in step 5A, your integration service can return a manifest to Zendesk Support. The manifest describes the location of the other endpoints. However, you still need to inform Zendesk Support of the url to the manifest. This is done via Zendesk app requirements. You need a Zendesk Support account to test this step. In this tutorial, the integration service you built runs locally, so Zendesk Support can’t reach the integration service directly. To test the integration service, you can use a tunneling service. It is also possible to deploy the integration service to the public extranet. This tutorial doesn’t cover that. You can use the ngrok tunnel tool to allow Zendesk Support to communicate with the Integration Service running on your local machine. Run ngrok http 3000 . Ngrok will set up a public address for the WordPress integration service running on port 3000. Note : The Channel framework requires https. 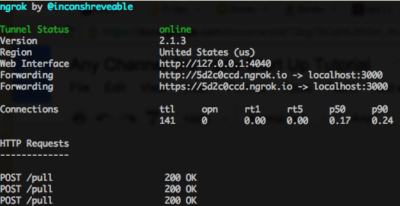 Note : The free version of ngrok doesn’t support a fixed subdomain. Make sure you don’t restart ngrok or you will need to modify and reinstall the Zendesk app again. It is fine to restart the integration service or WordPress server. To build the Zendesk app, you need to have the Zendesk App Tool. 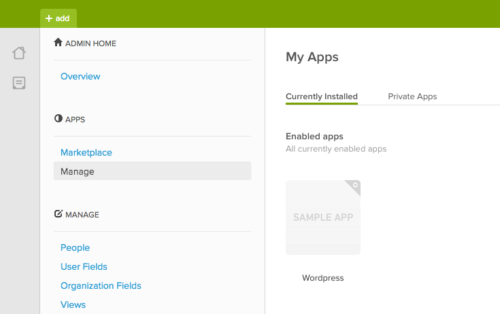 Read the Zendesk App Tool documentation on how to install the tool and package the App. After filling in the integration_service_location in requirements.json, run the zat package command in the /requirements_only_sample_app directory to get a Zendesk app zip file. Follow the upload and install instruction to upload and install the local Zendesk app in your instance of Zendesk Support. Comments on WordPress posts should become tickets in Zendesk Support. In addition to setting up the integration service, the Zendesk app may also have other code in it to enhance the Zendesk Support UI. Read the Zendesk Apps documentation for more information. Continue on Channel framework startup tutorial - Step 7: Store state information in Zendesk Support (Metadata, Pull State) . Thanks for the tutorial. The screenshots in this guide (ie: in step 6) are broken. In addition, the Github repo in step 6 part 2 (https://github.com/zendesk/demo_apps/tree/master/v1/requirements_only_sample_app) doesn't exist anymore. Thank you for pointing this out Dan. I've submitted this issue to our documentation group. In the meantime, this reference may help as it's related: Creating a requirements-only app.